Still riding high in some of the cooler dance charts with his previous release, F1END keeps up the pace with his latest tune - Epic. Tune titles should give a clue of the tracks style and this one does just that. 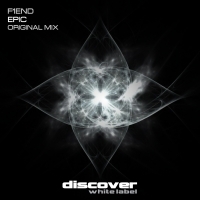 Acid, plucks, a killer bass, huge breakdown, stylish arrangement - Epic has it all. F1END defintely cements his "one to watch" status with this one. 'Epic' is available now from Beatport and iTunes.